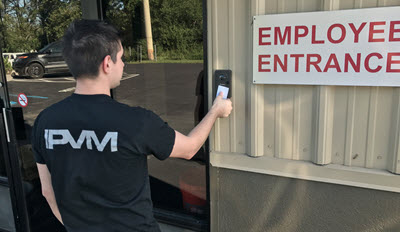 Geovision has released the GV-CS1320 door station, priced at a fraction of others, with additional bells and whistles like a built in card reader, face detection, and capacitive touch button, and more. We bought and tested the CS1320 against the Axis A8105-E to see if it can hold up against higher priced models or if its low price also means low performance. Those interested in other door stations should also see our test of the Axis A8105 Door Station and DoorBird's D101, as well consumer doorbells Ring Pro and SkyBell HD. Future door station tests will cover Dahua, Hikvision and others. ********* *** ******** *****-****** **** *******, ****** ** * ******** ** ******, **** ********** ***** and ******** **** * ***** ** **** ******, **** *********, and ********** ***** ******, *** ****. ** ****** *** ****** *** ****** ******* ******* *****-*** *** ** ** *** **** ** ******* ****** ****** models ** ** *** *** ***** **** ***** *** ***********. ***** ********** ** ***** **** ******** ****** **** *** *** test ** ******* ***** **** ******************'* ****, ** **** ******** ************* ************* **. ****** **** ******* ***** **** ***** *****, ********* *** others. ******, ** *****, ** ****** **** ******** ** * ******** of *** ***** ** ***** ********** **** ********, *** ******'* reliance ** * ******* ****** (****** ***** ********* *******) *** a ******* ***** ** ****** ******** *** ********* ** ******* in *** *****. *******, *** **** ** */* *** ************* ***** ******* **** third ***** ***** ***** **** ************** **** ** ****** *****, *** ****** ****** ** ********* to *** ********** **** (*****, *****, */*) ***** *********, ****** the **** **** ******* ****. *******, *** ***** **** ********** ***** *********'* ********* *** ***** access ******** **** ***** ******** ***** ******* *** ********* ******, the **-******'* ***** ***** *** ***** ******* *** **** ** an ********** ******. ***** ******* ***** *******:*** ******'* ***** ******* *** ******, **** ******* ******* ******* in ******* ************ ********* (*******/******** *****), ****** ******* ***** **** the **** *****-* ***** ******** ******** ******* **** ***. **** ***/*** *********:** ****** **** ******* ***** ***********, *** ****** ******** ***** details **** *** **** ***** *** ** *** **** ** true ***. *** ******* ** ******* "***" *********** ******* *** ****. *** ******'* *** ******** ******* ******* ****** *********, *** at *** ******* ** ********** *******, ***** *** ****** ******* washed *** **** *** ****** **. **** *** ***** *******:*** ****** ******** ****** ******* ** ******** ** *** ***** due ** *** ***** ** ** ***********, ***** *** **** A8105 *****. ** *** *********** ******:** *** *****, *** ****** ********* ** ********, *****, *******, and ********* *** ***** ******* ******, **** ***** *** ********** audio *********, *** ** ******** ***** ** */* ******* (*** are ********* ** *** **** *****-*). **** ***** *******:***** ** **** ********** *** ***** *** *** ***** ** all ****** ******. ********* **** *** ***** ***** ********* ** echo ************, *** *** ***** *** ***** ******** ** *** station's *** *********. ******** ******* **** ********* ******:*********'* ********* ******** (******** ** ******* **** ******, ********* ****** cards *** *****, ***.) *** *********** ** ***, **** ******** install ***** ***** ****** ******** ***** ****** *******, ********* *******. Once *******, *** **-****** **** *** ******* ********** ********* ** offline ******* ***** ******, **** ***** *** ***** ********* ******* fine. ****** *** ******** ********* ******:****** ***** ******* ***** *** ***** ************ ** ******* **** stations ** ****** ****, *** **-****** ****** *** ******** * local ****** ******* ********* **** * **** ********* ******** **********. *** ********* **-****** *** *********** ****** *** ~$*** ***, * ******** ** *** ***** ** ******* *****-* **** *******(~$*** ***), ** *********** ****($***), **** ** ***** **** *** ******'* ****** ******* ******** (though **** ******* ***** ************ *** ***** ** *********). *** **-****** ** ********** ******* ** ***** **** ********, **** the ******** ** * **. ** *** ****** ****** ***** ** to *** ****** ****** *** **** ******. **** **** **** the **** ****** ** *** ****** ** ********** *****, ** less ***** ** ********** ******* **** ******, *** ** *** not ** ******** **** ****** **. ** ****** ******, *** **-******'* ***** ******* *** ******, **** details ** *** ******* ********* **** ******* (**** ** ** entrance) *** ****** (** * ***** *****). *******, ******* ***** was ****, **** *** ******'* ******* *** ***** ****** ** affect ***** *******, ***** *** **** *** ******* **** *******, but ****** *** ********** *******. ******** *******, **** ** *** *****, *** ***** ** **** is ***** *****. *** **-****** ** *** * **** *** ******, *** ******** backlight ************. ** *** *****, *** *** ********* ** ******** exposing ******* *******, *** ** *** ******* ** ********** *******, which ****** ****** ******* ****** ***. ** ********, *** **** ***** ******** ****** ******* ** *** subject, **** ********** ******* ******* ******* *** ** *** ******** WDR ***********. ****** * ********* **** ***** *****, ******** ******** *** **** harsh, ~*,*** *** ******* **. ~*** ******. ** ********, *** **** *****-* ******* ******** **** ********** *** background *** ** *** **** *** *********** (******** *******), ********* better ******* ** *** ******* *** ***** ******* ******. *** ** *** ***** ** **, *** **-****** *** **** to ******* ****** ******* ** ******** **** *** **** ***** in **** ******. *** *******, ** *** ***** *****, chart ******* *** ******* ******* ***** ** ** ******** ** noise ** *** *****. *** ******'* ***** *** **** *** ***** ** *** ****** tested, **** *** ***** *** *******. *** *******, ** *** clip ***** *** ******* ** ******** **** * **** *******, but ***** **** ******** ** **** ***. ******, ***** **** **** ** *****, ** ****, ****** ******** perceptible ** ***** ***********/**** ******** ** **** ******. ** *** *****, ** *** ** ****** ********** *** ****** to ********, *****, *******, ** ********* *** *****. *******, ***** VMSes **** ********* ***** *** ********** *****. ** *** ****** allowed ******** ***** ** */* *******. ****** *******, ** ***** ******** ****** ********** *** ***** **-*********, Geovision's ****** ********** ********, ***** ** ******** ** ******* ***** notification *** ****** ********* ** ****** *****. ******* *******:************ *** * *****-**** *******, *** **** ******** *********, **** a ******** ******* *** *********, ******* *** ************* ********* ** the ****** *****. ******* ** ****, ** ** ***** *** installation, *** **** ******** ******* *** ****** * ******** *** configured, ******* ******. ****** ********:********* **** ********* ****** ** *** ******** ** *******, **** less ****** *** ***** ********** **** *** ********* **** ** most ************/****** ********. ********* ******:*******, ****** ******* ** *** ******** ********* ******, **** *** controller ****** ******** ******* ******* ***********. ********* **** ******** **** someone ****** *** **** ******, ********* ****** *************, *** ********* when ****. **** **** ********* ** ******** *** ********* ** ***** *** desktop *** ****** **** (*****). ** **** ** ******* ** a ******* ******* ********* ** *** ******** (****** **** ********** required, ** ***** ************) ** ***** ** ******* ***** ******* the ***** *******. ***** **** ****** *** ** ******** *** ****** *** (**-******), with **** ************* **** ****** *****, ******* ******/****** *** **** release *******. **** **** ***** ** ** *** ** ****** ** ***** or ******** * **** **** * ****** *********** ******. ** ***** *** ** ***** ****** * **** is *********, ****** *** **** *** ** ******** ********/******. ********* **** *** ******* ***** ************ *** *****, ****** ***** doorbells/door ********, **** ** ********-*,********, ******. *******, ***** **** ******* *** ****** ** *** ****** Manager ****** (*** *****) ***** **** **** ** **** ********* manually. ***** **** ******** ** *** ***** ******* *** ** answered ** ******* ** *** ***** *******, *** **** * phone ****** **** (********* ** *** **** ****** *******, *** example) ***** *** ** ****** ****** ** *** ****** ******.